In this episode of the profit, Marcus Lemonis visits Worldwide Trailers. 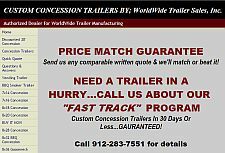 Worldwide Trailers is a company that manufactures and sells concession trailers located at Tampa, Florida. They specialized in food trailers, manufacture cable splicing trailers, mortuary trailers, tailgate trailers, refrigerated trailers, emergency response trailers and restroom trailers. The business started by a former couple Tom and Nancy in 2001. Even if their personal relationship ended some years ago, they still remained business partners. Worldwide Trailers makes $4 million in profit in the earlier years, but this reduced to around $400,000. Marcus believes that if only Tom and Nancy understand the industry, the business can earn more than 10% revenue every year. Worldwide Trailers employs almost 20 employees. Marcus firmly believes that Worldwide Trailers can make it big. However, Tom and Nancy’s constant disagreements and fighting get in the way. Nancy hardly separates her personal dealings from the business. Worsening business relationship between Tom and Nancy. Not enough number of workers. 2 separate facilities that are miles apart. No inventory and checkout list. No cost analysis and quality control. Marcus is confident that Worldwide Trailers can grow into 20-million-business or even bigger. He proposed a deal to Tom and Nancy. His initial proposal was $500,000 for 50% ownership. Tom liked the deal and he wanted to go for it, but Nancy was having second thoughts. She believes that the business and her shares are worth much more than what Marcus has offered. Marcus then offers $700,000 so that $600,000 will go to the business, and Tom and Nancy will get $50,000 a piece. Everyone agreed, and the deal was made. The bank check was signed, and they shook hands. Establish a sole facility in Georgia. Introduce a new inventory system. Make a checkout list and improve quality control. Create accurate and up-to-date reports. Employ the right process in place and protect the jobs of the workers. Marcus announced to all Worldwide Trailers’ employees about the deal that he, Tom, and Nancy closed. He told them that changes in the process will be incorporated to achieve a higher efficiency level. Marcus brought an inventory group to Worldwide Trailers to do auditing of materials. It was discovered that the company lost $80,000 in inventory. Marcus was trying to convince Nancy to move to Georgia to focus on running the business. He brought her to a potential new home. Unfortunately, Nancy has not made her mind yet. It is so hard for her to let go her beach house and believes that Tom will not move to Georgia either. Sadly, because of Nancy’s failure to accept change and stay professional despite her personal issues with Tom, Marcus found it hard and impossible to help Worldwide Trailers. Nancy kept on insisting that she needs no one, and she can run the business as she did before. When Nancy discovered that Tom’s girlfriend had been working with the company behind closed doors, she started a heated argument in front of Marcus. She even invited the employees to see the dispute. She first said that the deal was off. Afterwards, Marcus withdrew the deal, thinking that Tom and Nancy cannot leave their past behind. They cannot focus on Worldwide Trailers alone. Do you know what happened with the company after the show ended? What kind of dof was that in this episode? They added a facility to the Waycross location to combine the two locations.